Shah Jehan, the architect of the Red Fort and much of Old Delhi, built Jama Masjid between 1644 and 1656. This grand structure is situated on a hill a few hundred yards west of the Red Fort, and towers over the mayhem of Old Delhi's sprawling streets. 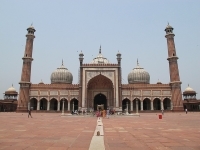 Jama Masjid is India's largest mosque, and can hold 25,000 worshippers at one time. Wide red sandstone steps lead to entrances on the north, south and east sides of the mosque. Inside is a massive courtyard, dominated by two red-and-white striped sandstone minarets that cap the main prayer hall on the west side (facing Mecca). There are smaller towers at each corner of the mosque, and energetic visitors can climb the 122 narrow steps of the southern one to be rewarded with magnificent views of Old and New Delhi. Those wearing shorts or skirts can hire a lunghi to cover their legs. Women wearing T-shirts should bring a scarf to cover their shoulders. Visitors will be required to leave their shoes at the entrance. Tourists frequently complain that the people managing the mosque are rude and try to get as much money as possible out of visitors by charging for things like shoe storage and modesty dresses they insist women wear even if they are appropriately clad. The best way to deal with these inconveniences is to have a local guide to help navigate through the process.